I went out today to try to get some Accidental Rennaiscence composition, but was carried away with this leading line of soldiers' boots. 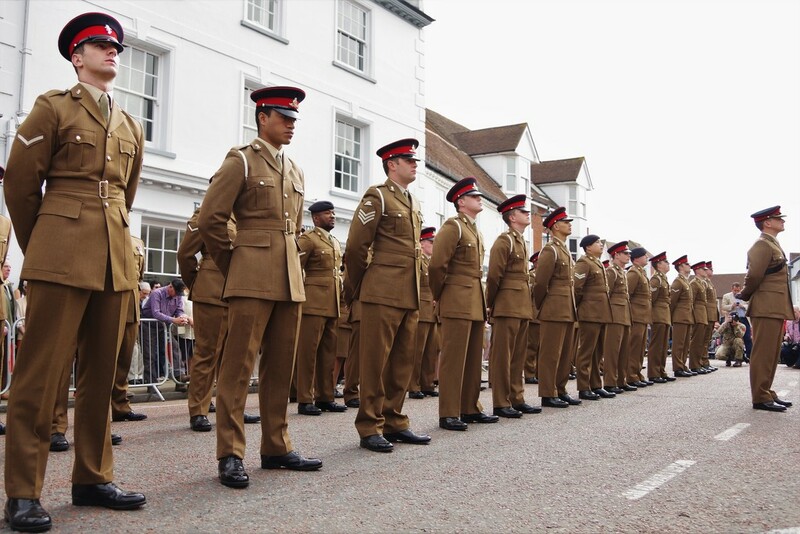 Every soldier and veteran on the parade was given an Emsworth Rose, formerly known as the Imjin Rose, to commemorate a battle in the 'Forgotten War' in Korea. A poignant and sombre parade. It's my day to upload a photo to The Darkroom so I have a shot of an Emsworth Rose that was pinned to a veteran who fought in The Korean War 60 years ago. Tags parade, soldiers, leading line, do you think the croucing army photographer deleted the shot he took with me in? Great leading line and pov. I like the way how those soliders are honoured. Great leading line of shiny, shiny boots. Great POV too. You've even caught a military photographer at the end of the line. Cool pov - and hardly anyone knows that there were British Army soldiers fighting in Korea, really forgotten. My father was seconded to the NZ navy and was there, and I used to share a flat with someone else whose father was a soldier in that war. It wasn't a great war. @4rky and he got me too!! @grammyn thanks Katy, love it when a planned arty shot actually works!! Doesn't happen often enough!! Great photo. Any idea why they changed the name of the rose? Imjin I recognise as a Korean War reference, Emsworth not so much. What a great leading line! Great leading line. Interesting study of fitting the visor from the hat on the eyes.